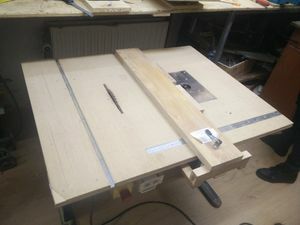 Project by user:Justa (inspiration, design & brainstorm) and User:ultratux (design & actual implementation) to 'morph' our tiny tablesaw into a large-format saw table with an integrated router. Will be filled in further later. Do note: You require training to use the saw / router table. It is not a tool that can be used safely without proper training on 1) How to use any table saw or router, 2) specific details and caveats of this one. This page was last edited on 30 March 2017, at 10:29.